V2526. ERNEST BLANC, w.Cloez, Gressier, Cluytens, Pretre, Dervaux, Cruchon, Pritchard & Gui Cond. 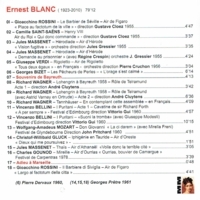 : Arias from Thais, Mireille, Herodiade, Les Pecheurs de Perles, Rigoletto, Lohengrin, Tannhauser & Die Walkure; ERNEST BLANC & REGINE CRESPIN: Herodiade - Demande au prisionier. 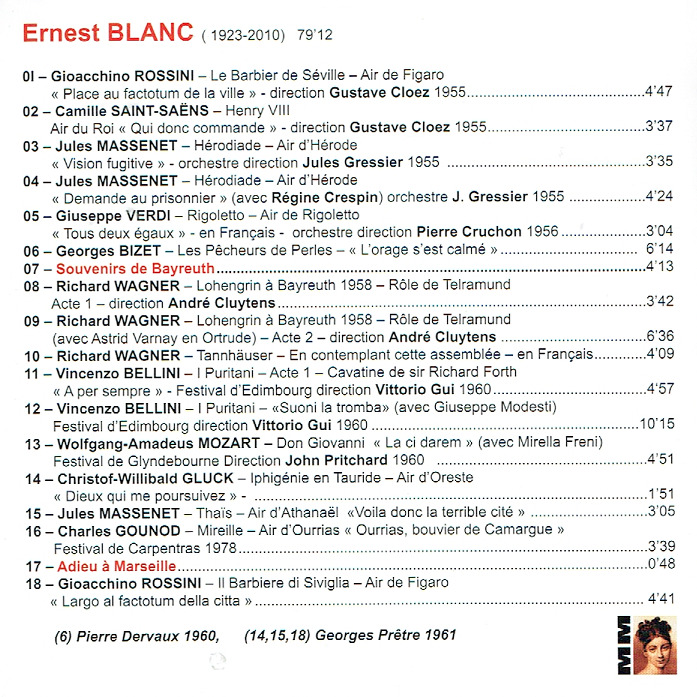 (France) Malibran 139, recorded 1955-78, partially live performances. 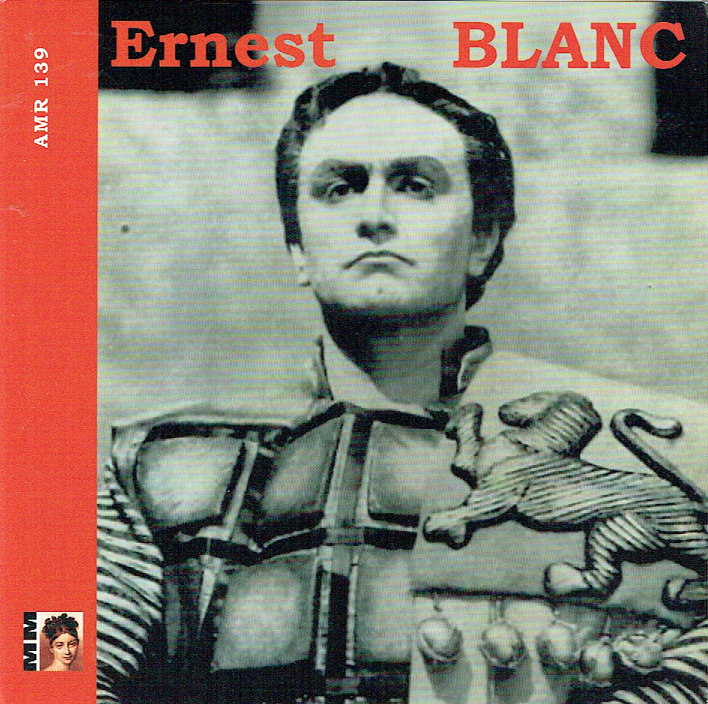 "Ernest Blanc, one of the leading baritones of his era in France, made his debut in Marseille, as Tonio, in 1950. He then sang throughout France in the French and Italian repertories. In 1954, he made his debut at the Palais Garnier in Paris, as Rigoletto, he sang there as first baritone for 25 years in a wide repertoire (Rameau, Mozart, Gounod, Bizet, Massenet, Verdi, Puccini, etc.). He also appeared often at the Opéra-Comique, and was a regular guest at the Aix-en-Provence Festival. His career took an international turn in 1958 with his Bayreuth Festival debut, followed by debuts at La Scala in Milan, the Royal Opera House in London, the Glyndebourne Festival, the Vienna State Opera, the Salzburg Festival, La Monnaie in Brussels, the Grand Theatre de Geneve, the Monte Carlo Opera, the Teatro Nacional Sao Carlos in Lisbon, the Liceo in Barcelona, the Teatro Colon in Buenos Aires, the Berlin State Opera, etc. He also enjoyed considerable success in America, at the Lyric Opera of Chicago, the San Francisco Opera, etc. Notable roles included Don Giovanni, Valentin, Zurga, Escamillo, Golaud, Germont, Renato, Amonasro, Scarpia, Riccardo in I PURITANI, opposite Joan Sutherland, Alfonso in LA FAVORITE, Wolfram, Telramund, etc. A stylish singer and a fine musician, he possessed a beautiful voice with a brilliant upper register and impeccable diction, one of the few post war French singers to have enjoyed a truly international career. After his retirement he taught in Paris."